southern and western Louisiana. I was quite happy to share with Grav a previous find, which turned out to be the day's highlight -- Cajun Landing in Alexandria. I first discovered the restaurant on the north side of town while traveling with friends in 2002, and I've been back several times. But this was the first chance I had since 2007 to step back through the doors for an early, leisurely dinner, and now I'm sharing that opportunity with y'all on the blog. Because it was fantastic. Cajun Landing started more than 20 years ago, and it feels like a permanent fixture for the town. On my previous visits, I've fallen into the extraordinary Étouffée and delighted myself with the crabmeat and mushroom topped Chicken Pontchartrain. And I've dreamed about the Seafood Bisque. Our waitress was Geannie, and she was patient while Grav got settled from the drive. She was even patient when we requested to move to another table to capture good light. Once our orders were placed, our soups were brought to the table. With entrees, there's a choice of soup or salad, and really -- you should just get the Seafood Bisque and be done with it. Order a salad if you like, on the side, but take a few minutes and savor this wonder. And I mean savor. 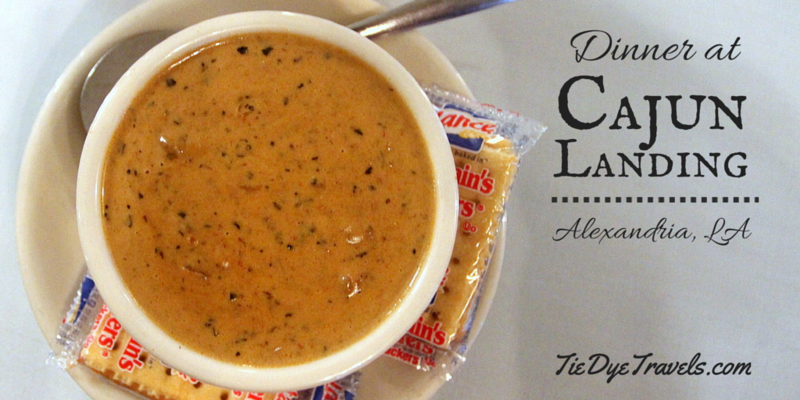 Impossibly packed with savory and sharp spices, layers of heat and cream, chunks of crabmeat and crawfish, Cajun Landing's Seafood Bisque will make you shed a tear not for spiciness or pain but for the delectable elegance of it all. It is a masterpiece. And, as we found out, the recipe's for sale for $5, which we happily added to our bill. heavenly in every respect. The side item in this case was a mixed squash and zucchini medley. and a side item, this time garlic mashed potatoes that I didn't really touch until I ate them later with my fingers in a Dallas hotel room. Maybe that's oversharing. It was a FEAST. which we found are actually baked and then lightly fried to obtain that level of perfection. These meals would have suited us well on their own, and we would both have happily rolled out the door and onto the highway well-satisfied, but Geannie talked us into a dessert. Well known for their bread pudding, Cajun Landing also offers creme brulee (which I've had, and it's fantastic) and Key lime pie (which I've also had, and it's marvelous, too). But this time we chose a dessert I hadn't sampled -- a deep fried cheesecake. hotel reservations so we could recuperate from our self-induced dining overindulgence, but more assignments down the road awaited. rather than so far to our south. Alas, I'll have to settle for the occasional journey down I-49 to this pleasant place, and thank heavens that it isn't closer and I can never grow tired of what it has to offer.